PUBLISHED IN: Originally in 1998. Now a new revised edition was published in 2015. THE EDITOR: The first, David Memmott. The new one for the re-published volume, Walter Cummins. SUMMARY: This is an alternate history of what became of Buddy Holly, Ritchie Valens, and the Big Bopper when the plane went down that frigid night just outside of Clear Lake, Iowa, after their great show at the Surf Ballroom. But it is a lot more than that; I wanted to take all the 1950s and 1960s rock conspiracy theories and dovetail them into a spoof, and satire of rock culture and mania, conspiracy theories—connect them all somehow, and turn it into a comedy to make a sad song better. I saw it as a grand put-on. I think that is what it is. THE BACK STORY: I grew up in the 1950s and 1960s. I had two older teenage sisters who brought home these wonderful 45 RPM records—rock and roll. I was an instant convert at the age of seven and even began taking guitar lessons so that I could be like Gene Vincent, Eddie Cochran, Ricky Nelson, Dion and the Belmonts, The Coasters, Chuck Berry. I played in rock groups throughout high school and college. I have always loved the music of the early rock and roll progenitors. I used to race home from school to watch American Bandstand. At the age of nine I was convinced I would be a rock and roll star. My dad was a banker—talk about boring. That was not for me. I spent hours listening to all the hits, singing along with them, learning how to play the songs on my guitar. And I read about the stars—what there was to read in those days. Not much. And then Buddy and the Bopper and Ritchie were killed, and my sisters came home from school crying, and I cried too. Why did you decide to write it? How did you research it? How long did it take to write? Whatever you think might be of interest. I was looking for an idea for a novel and I had seen The Buddy Holly Story. I always loved that period of Rock and Roll history. 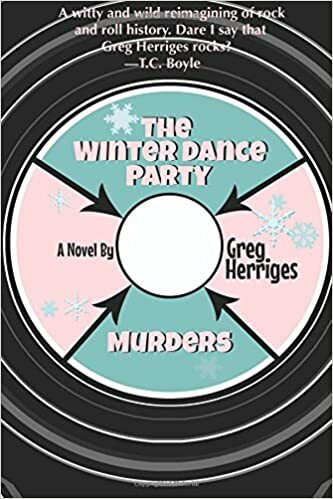 And because I am a wise-guy by nature, a fellow who can do comedy pretty well (just read my reviews) I invented a narrator and protagonist, Rudy Keen—an unreliable nobody who claims he was on the Winter Dance Party tour in February on 1959. This novel took two years to write. I meticulously researched it—so if I say so-and-so were in LA on a given date, they were. But consider this: aside from growing up on the music, I interviewed Dion three times in the seventies and eighties, and he was on that Winter Dance Party tour. I had conference calls with Bobby Vee and Paul Anka in my rock and roll class that I team-taught with Dr. Kurt Hemmer at William Rainey Harper College. Bobby replaced Buddy the day after the tragic accident in Moorhead Minnesota, and Bob Dylan was his keyboard player. When I learned all this I knew I could mix it all up in a rock and roll novel and come out with hilarious results. The truth really was stranger than fiction. So I turned it back to fiction and made it even stranger. You get Buddy Holly surviving, fighting with John Lennon, Rudy the narrator telling Sam Cooke to give up women, Holly wearing a fairy princess mask to conceal the burns he suffered in the plane crash. People will probably think I was on acid when I wrote it, but that is not the truth. Merlot? Perhaps, un poquito. WHY THIS TITLE? : The title of the tour is historic reality—the biggest rock and roll tour of its time. Add Murders to it, and you have an instant rock and roll mystery. WHY WOULD SOMEONE WANT TO READ IT? Aside from being completely nuts, anyone who loves early rock and roll, and those who believe we haven’t been told the whole truth about rock and roll deaths would love this book. Not much has been written about the death of Sam Cooke—but I have the goods. Read it here. Also—if you like dark comedy and conspiracy theories, you will enjoy this post-modern novel. According to critics and famous authors who have given me blurbs, it is apparently considered a very funny book. (I cracked myself up on every page as I wrote it—so add my name to the other authors.) In short—if you like rock and roll and you like to laugh, it’s up your alley. AUTHOR PROFILE: Okay—I’m writing this myself. This is Herriges on the page. I have always been a wise guy—not in the mob sense, but in the hothead, motor-mouth, funny manner—the kid who would get kicked out of class because he smart-mouthed the teacher or said the words you were not supposed to say in class. I have a problem with authority figures. I didn’t like them when I was in school, and I don’t like them now, and I’m still in school. I never got out. I’m a life-long student-educator. That’s what happens when you become a college professor. My heroes are Lenny Bruce, John Lennon, William Blake, Jim Morrison, and JD Salinger. None of those people suffered fools gladly, and neither do I.
I write rock and roll songs, short stories, essays, and novels. I am the senior member of the English Department at William Rainey Harper College. I have a record deal with Guerssen Records of Spain, and a book deal with Serving House Books of Florham, New Jersey, and Copenhagen, Denmark. I met JD Salinger when I was twenty-eight at his home in New Hampshire, and since then I have been writing fiction and never looked back. I spent a day and a night with Kurt Vonnegut when I was thirty-nine, and it left an indelible imprint on me—his humor, his great humanity. I have been exposed to genius—and let me throw Dion back in the mix, because I truly believe that he, too, is a genius, a musical genius. I am married to Carmen Perez, and we have a son, Jeremy, and a daughter-in-law, Heather, and in October we will have a granddaughter. AUTHOR COMMENTS: I am working on a new novel, a short story, and I have just completed an album of all new Athanor songs called Hills of the Universe—two years in production. Two singles have been released: “Autumn Slipping Away,” and “Now I Know.” My original interview with, and profile of JD Salinger will be republished in December in a volume edited by David Streitfeld (of The New York Times) on Mellville Press. My essay “The Ear” has just been published by The South Carolina Review (Google it), and my interview with rocker Marshall Crenshaw was just published by Rock Music Studies of England. LOCAL OUTLETS: Breadloaf Bookstore, Lake Geneva, Wisconsin. I’m intrigued. Adding this one to my READ list as well.